This week, students host convergences, boycott standardized tests and chain themselves to a potted tree. Can need-blind admissions be saved at Wesleyan? After Adios Arpaio, what's next for Arizona? 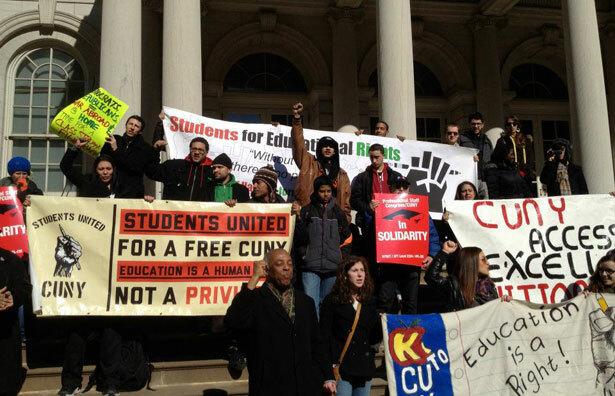 E-mail questions, tips or proposals to studentmovement@thenation.com. Check out the previous round of dispatches, from January 18, 2013, here. I first got into politics registering voters to get rid of Sheriff Joe Arpaio. My brother-in-law had just been deported, and my dad had been in Arpaio’s Tent City, so I connected. I learned that we can all do something to change things that aren’t right. That’s why, as a high school senior, I’m active with UNITE HERE. We’re making sure people know that Phoenix City Council elections are coming up, and why they are important. I was raised by a single mom. She always had to do little jobs here and there—minimum wage jobs. She was a driver for a hospital, a store cashier, and she worked on an assembly line. She always made sure we were happy, but sometimes there wasn’t enough food to last. My mom has a better job now, but a lot of people are still struggling. I want to elect someone who will do something good for our community, like raising the minimum wage. If the jobs are better, the neighborhood can be better. It’s different from talking to people about Arpaio, but it’s also the same. I am going out and listening to people’s stories and telling my story. On January 22, a group of seven young activists chained themselves to a potted tree in the corporate headquarters of Arch Coal in St. Louis, while others sang and dropped banners in the lobby, calling on Arch to end mountaintop-removal coal mining. On January 25, over 100 students, young people and allies protested outside of Peabody Coal, the world’s largest coal corporation, where twelve people were arrested trying to deliver a letter from the Dine (Navajo) community of Black Mesa, Arizona, to Peabody CEO Greg Boyce. Both actions were part of the Winter Action Camp hosted by MORE, BMIS and RAMPS, which united the voices of indigenous and Appalachian communities impacted by coal mining, bringing them together in St. Louis, the hometown of five coal companies. The many students participating in the action at Peabody also took a stand against their own university’s corporate collusion: At Washington University, Peabody and Arch CEOs sit on the Board of Trustees and fund coal research. Students at the university are continuing a divestment campaign to stop endowment investments in fossil fuel companies and rid their Board of Trustees of dirty energy CEOs. United Students Against Sweatshops at the University of Michigan has been rallying the campus community in an escalating campaign against Adidas. The German sportswear giant has come under fire by student activists across the country for sweatshop abuse, including its refusal to pay $1.8 million in legally owed severance pay to 2,800 former Indonesian workers following the closure of PT Kizone, an Adidas supplier factory, in 2011. Michigan students are demanding that the school initiate the process of terminating its $60 million contract with Adidas, unless the brand pays the former PT Kizone workers their legal severance and commits to end its pattern of workers rights abuse. The campaign has gained traction on campus with creative tactics that include an “Adidas Dirty Laundry” clothesline strung across the center of campus, and a “Wolverine Pride, Adidas Shame” flashmob at a recent Michigan parents’ weekend football tailgate. Workers from PT Kizone will come to campus as part of a nationwide Adidas worker tour on February 13 and 14 to speak out about their struggle. Students in Florida are pushing back against Governor Rick Scott’s higher education reforms, which would hand over total control of the state university system to an unelected board appointed mostly by the governor. Working with the Graduate Assistant Union and the United Faculty of Florida, the student political party FSU Progress Coalition is drafting a joint statement of opposition to the governor’s recommendations. It is also working with student organizations across the state through the Florida Alliance for Student Action, and on January 17, students held a speak-out in the building where university system’s Board of Governors was meeting. The group will be coordinating further actions across the state and looking to testify against future legislation as it comes to committee. In addition, environmental activists from at least six universities in the Florida YES (Youth for Environmental Sustainability) coalition will be coordinating a divestment campaign to get Florida universities’ endowments out of problematic industries like fossil fuels. This February 22 to 24, 150 students are expected to come together at Swarthmore College for Power Up! Divest Fossil Fuels, a student-organized convergence of youth activists working to divest their colleges’ endowments from fossil fuel companies. While college administrations have largely been hostile towards divestment, student campaigns have been gaining attention nationwide with petitions, referendums, public art displays and rallies, and students are ready to escalate their campaigns by putting more pressure on administrations through direct action. The upcoming convergence will be an opportunity for students from across the country to meet, share skills and develop strategy to grow a powerful national movement. The Native American and Indigenous Student Alliance (NAISA) at Northwestern University has started a campaign this month to recognize a darker aspect of the institution’s history. One of the founders and a primary benefactor of Northwestern University, John Evans, ordered the suppression of native peoples as governor of Colorado and decorated soldiers who massacred unarmed Native Americans at Sand Creek. The alliance recently hosted a memorial in honor of the massacre victims and is promoting an online petition calling on the university to formally recognize Evans’ responsibility for the massacre, establish a Native American Studies Program, build a memorial to the victims and start a scholarship fund for Arapajo and Cheyenne students. While the university has changed Founders’ Day to a birthday celebration for the institution, the alliance continues to push for its petition demands to be met. At Wesleyan, student activists spent much of the fall semester protesting the university’s move away from need-blind admissions, culminating with an occupation of a Board of Trustees meeting and a homecoming football game protest that caught the attention of a Democracy Now! segment. In recent weeks, a petition by Lana Wilson, a member of the class of 2005, has garnered over 400 signatures from students, alumni, and parents. Addressed to President Michael Roth (who receives an e-mail for each signature), the petition asks that Wesleyan “continue [its] practice of admitting the best students possible, rather than those with the most personal wealth.” While the author makes no reference to alumni donations, a substantial number of signers echo a previous petition by expressing a refusal to donate to the school—just as Wesleyan begins a public capital campaign. Meanwhile on campus, a student government group called the Student Budget Sustainability Task Force is meeting to seek financial alternatives to cutting need-blind admissions. It will present its conclusions to the Board of Trustees later this semester. In Richmond and Oakland, California, high school students are organizing for equitable school funding through Youth Together’s Kids Count! campaign, which is staging local events including community town halls and classroom presentations. The goals are to improve California’s education system by supporting the passage and implementation of the governor’s Local Control Funding Formula. This will allocate funds to public schools based on a formula grounded in need—not mere test scores. As such, schools with a higher percentage of English Language Learners and low-income students will be eligible to receive increased funding. The Student Unions of Portland, Oregon, are collaborating on an “Opt-Out” campaign as the district goes into another round of standardized state tests. The Unions are encouraging students to opt out of taking their standardized tests because: they inaccurately display students' knowledge; they’re expensive; they offer little feedback; scores highly correlate with race and class; and testing promotes a more standardized education system. The group’s ultimate goal is the elimination of standardized testing and implementation of a more comprehensive, community-based evaluation system.